Harold Thomas Martin, a 51-year-old US National Security Agency contractor from Maryland, may be remembered as the second Edward Snowden, although there are many differences between the two cases. Martin, a former US Navy officer with top secret national security clearance, was arrested on Aug. 27 by the FBI and charged with the unauthorized removal and retention for many years of highly-sensitive classified documents. The purloined materials found in raids of his home and his car, which were described by as capable of causing “exceptionally grave damage” to US national security. 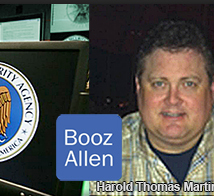 Like Snowden, Martin worked for Booz Allen Hamilton, which hires out workers skilled in intelligence fields to American intelligence agencies, which often prefer to employ some workers as contractors for economic and legal reasons. Senior members of the giant company, after they retired from the US defense sector, have strong ties in the corridors of power in Washington. In a statement, the FBI said that Martin admitted some of the charges against him, when a large cache of printed documents and computer files marked “top secret” or “sensitive,” were found in his home and his car, He also owned up to leaking sensitive documents from his office. His admission revealed that valuable sources of human intelligence (humint) and signal intelligence (sigint) had been compromised and assets were in danger of elimination. Marin’s motives, not so far revealed, for stealing NSA confidential materials differ from Snowdon’s urge to blow the whistle on NSA practices, which he claimed were in violation of the US Constitution. The programs he stole were not the same. They included a cache of codes for breaking encryption, some of which were connected to US efforts to hack into the cyber systems of such cyber adversaries as Russia, Iran, North Korea and China. According to some official sources, the disclosure of some of these codes could allow targets of NSA espionage to find out they were being hacked and enable some foreign secret agencies to reuse the tools. Clearly, the NSA had not improved its screening methods for employees in the three years since Snowdon absconded with countless classified documents, ending up in asylum in Moscow. Martin was assigned by the same contractor as Snowdon and passed all of the security checks including a polygraph test, before defeating NSA security measures and making off with a treasure trove of classified documents in printed and file form. In the last two years, Chelsea Mannin and Thomas Drake were also arrested and convicted as illegal leakers of classified materials. Wednesday, Oct. 5, Snowdon tweeted a message from Moscow suggesting an ulterior motive behind Martin arrest:”This is huge. Did the FBI secretly arrest the person behind the reports that NSA sat on huge flaws in US products?” he asked. The FBI and NSA are still trying to discover what drove Martin to his actions and to whom he passed the stolen files. Even though the part of Martin’s indictment that has been released does not reveal which documents he removed, the timing raises concern that the group of hackers which calls itself “Shadow Brokers” used some of the technological tools and programs found in Martin’s possession. It appears that the exposure of their activities around the time of Martin’s arrest was directly or indirectly connected to US intelligence organizations, and was intended to cover up a number of recent flaws, especially in firewalls. If Snowden’s suggestion is true, Martin’s actions aimed at exposing vulnerabilities in US cyber products worldwide. US intelligence could use these vulnerabilities to inject a code for monitoring and controlling networks and programs, such as those used for communication, data transfer, sending e-mails, or storage of documents. If that was Martin’s intention, many people, companies and organizations had an illicit motive for stopping him. These include computer program manufacturers, information security companies and even top US intelligence officials interested, for unjust reasons, in halting his research. An ironical finale of the Martin episode was the release in August of a new cyber product called “Insider4Sight,” designed to nab workers who filch sensitive materials from the databases of companies and organizations.